Female 54 years. Postprandial abdominal pain. Deranged LFTs. USS and CT-Scan findings: Distended gallbladder without discrete calculi, dilated intra and extrahepatic biliary tree. Cholangiography findings: Features suggestive of cholangiocarcinoma. Management: Right hepatectomy and Roux-en-Y reconstruction. Minimally invasive adenocarcinoma arising in a 55mm intracholecystic papillary-tubular neoplasm (ICPN) of intestinal type, invading into gallbladder muscularis. Intracholecystic papillary-tubular neoplasm (ICPN) has recently been proposed as a new disease concept in the classification of gallbladder tumours. ICPN is defined as a papillary or polypoid glandular neoplasm forming a localized, non-invasive mass (≥ 1cm) in the gallbladder. 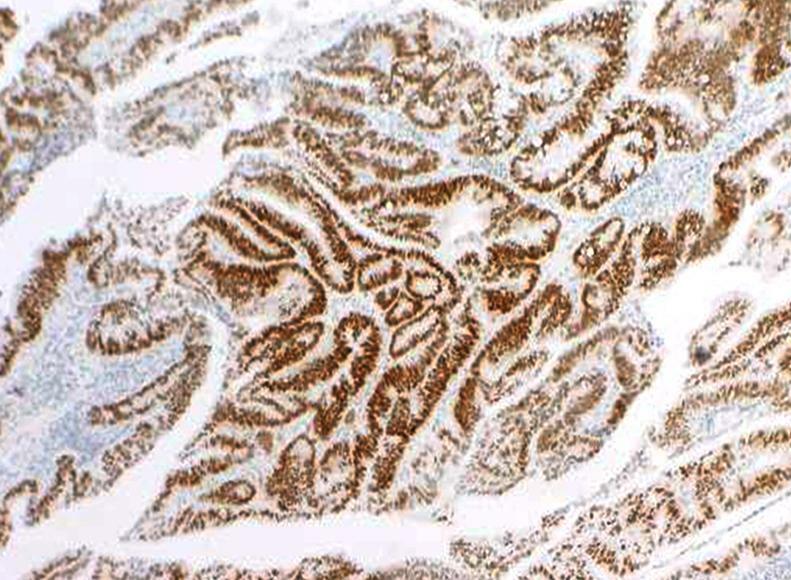 Adsay et al analyzed the clinicopathologic and immunohistochemical features of 123 cases with ICPN. The patients were predominantly female (F/M=2:1) with a mean age of 61 years. Half of the patients presented with pain. Radiologically, almost half were diagnosed as “cancer,” roughly half with polypoid tumour, and in 10% the lesion was missed. Pathologic findings: 1) The predominant configuration was papillary in 43%, tubulopapillary in 31%, and tubular in 26%. 2) The predominant cell lineage (>75% of the lesion) was identified as biliary in 50%, followed by gastric foveolar (16%), gastric pyloric (20%), intestinal (8%), and oncocytic (6%). 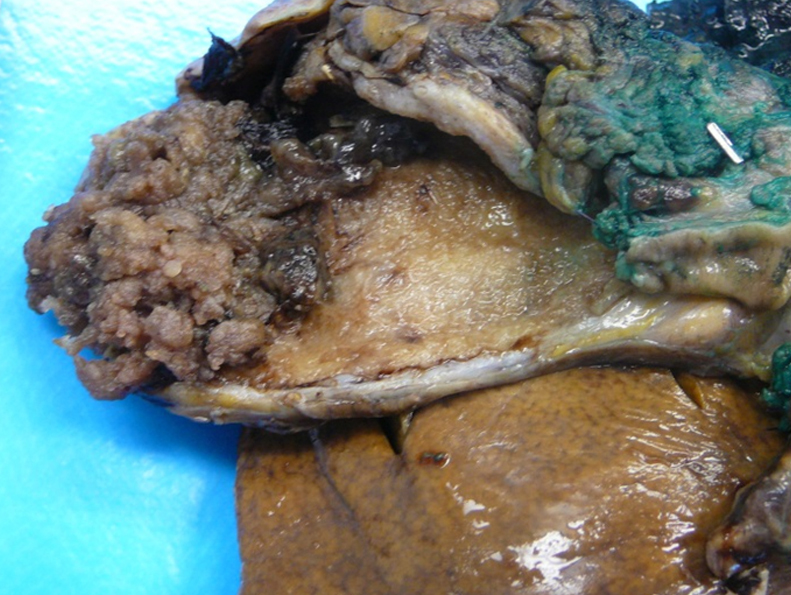 3) Overall, 55% of the cases had an associated invasive carcinoma. 4) The 3- year actuarial survival was 90% for cases without invasion and 60% for those associated with invasion. In contrast, those associated with invasion had a far better clinical outcome compared with pancreatobiliary-type gallbladder carcinomas (3-yr survival, 27%), and this survival advantage persisted even with stage- matched comparison. Intracholecystic papillary-tubular neoplasms (ICPN) of the gallbladder (neoplastic polyps, adenomas, and papillary neoplasms that are ≥1.0 cm): clinicopathologic and immunohistochemical analysis of 123 cases. Assay V et al. Am J Surg Pathol. 2012 Sep; 36(9):1279-301.